Edenbridge Community First Responders will demonstrate how to use a defibrillator and perform heart resuscitation and the Heimlich manoeuvre. A Halloween event, 3.30pm Wednesday 31st October at Hever Village Hall. 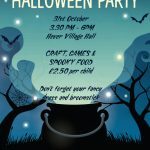 This event is aimed at families with children who cannot ‘trick or treat’ along our Hever country lanes hence the after school timing. Please email hra@hever.org to let us know you are coming. Children must be accompanied by an adult. Don’t forget your fancy dress and broomstick!